The new invaders who destroyed Lerna at the end of the Early Bronze Age in 2100 BC, were the Greeks. Unlike the people of Sesklo, Dimini and Lerna, these new people were Indo-Europeans, or Yamnaya. They came from Central Asia, and they spoke an early form of the Greek language. Other Indo-European groups, speaking related languages, reached Northern Europe, Italy, and Asia Minor (modern Turkey) about the same time. Probably all these people left home because of a serious drought that also ended the Egyptian Old Kingdom. Their special military weapon, which helped them to beat the Early Bronze Age people of Greece, seems to have been the horse, men fighting from chariots drawn by horses, or maybe just using horses to get from one place to another very quickly. Early Bronze people at Lerna didn’t have horses, and then the Minyans of the Middle Bronze Age (like other Indo-European groups) did have horses. 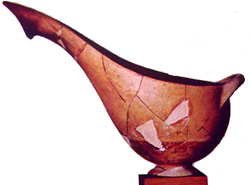 The Greeks also brought with them a new invention from West Asia: the pottery wheel. The wheel made it possible to make clay pots much more quickly, and therefore more cheaply, than before. For about five hundred years after the Greeks invaded, until about 1600 BC, not much seems to have happened in Greece. On the neighboring island of Crete, which nobody had invaded, the Minoans were building palaces and trading with the Egyptians and West Asians, but the Greeks were more isolated. They were busy learning the new culture of the people they had invaded and gradually mixing with the people who were already in Greece. The Middle Bronze Age in Greece has been called “500 years without an idea.” This is not quite right, though. The Greeks were getting ready for their first appearances in the Mediterranean political scene. Cite this page: Carr, K.E. Minyans – Middle Bronze Age Greece. Quatr.us Study Guides, July 8, 2017. Web. April 20, 2019.